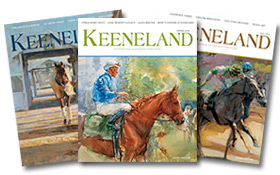 Keeneland magazine is an award-winning publication created to showcase Keeneland and the Thoroughbred industry and to provide readers both near and far with a taste of life in Central Kentucky’s unique Bluegrass Region. Keeneland magazine’s entertaining features and extraordinary photography make it one of the country’s most widely read regional lifestyle magazines. No other regional publication has the international appeal of Keeneland magazine. Through our partnership with BloodHorse, we access an affluent demographic unlike any other — top national and international horsemen, business leaders and professionals, Keeneland Club members, and a growing subscriber list. The magazine also is available at major bookstores and newsstands in Central Kentucky. We thank our advertisers for your support. If you have not yet placed an ad, we encourage you to consider Keeneland magazine as an important element of your marketing plan.